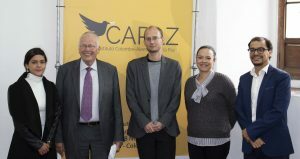 The German Commissioner for the peace process in Colombia, Tom Koenigs, visited the office of the CAPAZ Institute at the Claustro de San Agustín in Bogotá. Tom Koenigs held a meeting with Dr. Stefan Peters, academic director of CAPAZ, together with Mrs. Bettina Beywl, representative of the German Federal Foreign Office and Dr. Daniel Alscher, culture attaché of the German Embassy in Bogotá. During his trip to Colombia in May 2018, the German Commissioner gave some interviews regarding the Santrich case. Although it is a serious situation, Koenigs underlined his confidence on the institutions like the Special Jurisdiction for Peace (JEP in Spanish) and the ordinary justice. “We have to trust the created institutions”, he said. On the implementation of the peace agreement between the Colombian government and the guerrilla group FARC-EP, Koenigs explained the concern in Europe. “My biggest concern is the violence situation. In Europe, we are watching how social leaders are being killed, people who support the peace process, and the lack of security in the territories which are now free for the FARC-EP. That’s the biggest problem right now”, emphasized Koenigs. The last time Mr. Koenigs visited CAPAZ was on October 2017. At that meeting with the administrative staff of the institute, Mr. Koenigs got to know the future perspectives of CAPAZ, the projects and explorative studies and the plans of the CAPAZ office, which he had the chance to visit this year.